I really appreciate an opponent who clearly states his position and does not try to conceal it under a flow of verbiage and ornate disguises. So I liked the article which Prague Watchdog recently published under the title 'Irreconcilables’, by an author who is known to us by the name of Yusuf Ibrahim. I am not entirely sure that the person hiding under this pseudonym is actually directly connected with the Caucasus Emirate and its official ideology. I think he may rather be one of the "volunteers", conducting a "virtual jihad" far away from the forests of the Caucasus where, if we are to believe the two systems of propaganda, the insurgents are hiding. But let us assume that the ideas set out by Yusuf Ibrahim are very close to the moods and intentions of the aforementioned organization, which has, by the way, received de facto recognition from Russia’s Supreme Court. There is therefore a pragmatic sense in having this debate, and I will presume to comment briefly on Yusuf Ibrahim’s short but interesting article. Much of the article is a silly and naive attempt to claim universality and exclusive truth for Islamic doctrine, based on some dubious philological and exegetic musings on the origin of certain words and concepts. I think that most of this amounts to not much more than pointless rhetoric. After all, if a person is a Muslim then it will be clear to him that Islam is the universal and the only true religion. It will be clear to him because he is a Muslim. Yusuf I.’s political reflections are far more interesting. Without hesitation he argues that majority opinion does not matter, because most people are by nature " not leaders” – even, presumably, if they consider themselves Muslims and another name for them is the so-called "Ummah". For they are not leaders. And who are they, these ordinary people? The answer is obvious – they are "sheep". Thus, in Yusuf I.’s version of reality the world is dominated by a conscious minority – the "leaders" – while everyone else, the irrational, the irresponsible, the easily duped, the common people, the Ummah – are "sheep". The "sheep" don’t know what is good for them. The “sheep" are easy to manipulate, and this is something "democrats" take advantage of in order to subordinate them to their will. Therefore, democracy is harmful. But there is a select minority who have knowledge of the truth, and who know what is currently good for the world, including the "sheep". And because they, the minority, are "leaders", they are worthy to exercise power. The "leaders" must acquire power and retain it at any cost, even by force, without to the opinion of the majority, because the majority is still in a state of untutored ignorance. It’s a familiar refrain. Yes, it’s the concept of modern Russian "sovereign" democracy! 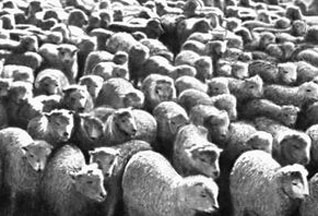 Surkov’s invention: the people are "sheep" who lack political awareness, and if you give them the freedom to choose they will end up under the influence of foreign agents and "Orange" troublemakers and lead the country into chaos. Yusuf I.’s refrain goes like this: the ruler should be a manipulator and demagogue chosen not by the stupid majority, but by "the one who is most God-fearing". Mr. Ibrahim's logic is that if the state is Islamic, and it can be if the people so desire, then the best ruler will be the best Muslim. Let us return to earth for a moment, and to the tedious business of practical politics. Who will determine which of the Muslims is the "best", the most "pious"? According to Yusuf I. it should not be the people, because they are sheep. Non-Muslims are excluded from the political process altogether. But the Muslims, the Ummah, the majority, should not decide anything either. Hence, the “leaders” themselves, who are a self-proclaimed elite, must elect or appoint a super-leader. In practice, the government in this scenario would be a group of adventurers with a smattering of ancient Arabic and a slightly better knowledge of the Rules for the Handling of Small Arms and Explosives. They will determine who is the most "pious". The system of government that is obtained as a result will be the purest form of clerical totalitarianism. I am even starting to change my opinion about the members of the Caucasus Emirate organization. I used to think that they were ideological fanatics who sought the victory of Sharia law at any cost, even that of their own lives. But after Yusuf I.’s article I am beginning to suspect that they are merely sheep-like imitators of the power-hungry individuals we already know Russia's leaders to be.